Celebrate birthdays where kids and kids-at-heart can play! Explore the museum with friends and family, then enjoy your private room to celebrate the big day. Members save $25 off all birthday party packages! By choosing FCMoD to host a birthday party, you also provide support for the museum’s exhibits, education, and public programs. Availability: Weekend mornings and afternoons. To book a birthday experience at the museum, please call FCMoD’s Event Coordinator, Brie Lipari, at 970-416-2727. Birthday parties are very popular at FCMoD, so we recommend booking 6 weeks out to secure your weekend of choice! Our basic birthday package includes a private 3-hour rental of a learning lab room, an FCMoD team member to help you with the big day, and complimentary museum access for the first 15 guests. Additional guests receive the group rate of $5 per person, children 2 and under are free, maximum of 50 guests. Want to keep the party going? Your pass is good for the rest of the day, so go play! Birthdays are so much fun, we require there to be a minimum of 1 adult per 5 children. Decorating and food is welcome in the Learning Lab, please, no glitter or confetti. Add on some fun and meet the creatures who live in Animal Encounters. A team member will bring these exciting animals to your private learning lab and let everyone get a hands-on learning experience. After learning about the animals, meet our very own Black Footed Ferrets in the Natural Areas exhibit! Create an experience of a lifetime with an educational and fun movie in Northern Colorado’s only Digital Dome Theater, the OtterBox Digital Dome. With a 35-foot-diameter screen and 4K digital projection, our dome will transport you to worlds you have only imagined! Set the soundtrack to your special day! Rock out in the music garage and make music with drums, keyboards, maracas, and more. We encourage you to embrace your inner musician, no natural talent required! *Only available for a limited time! 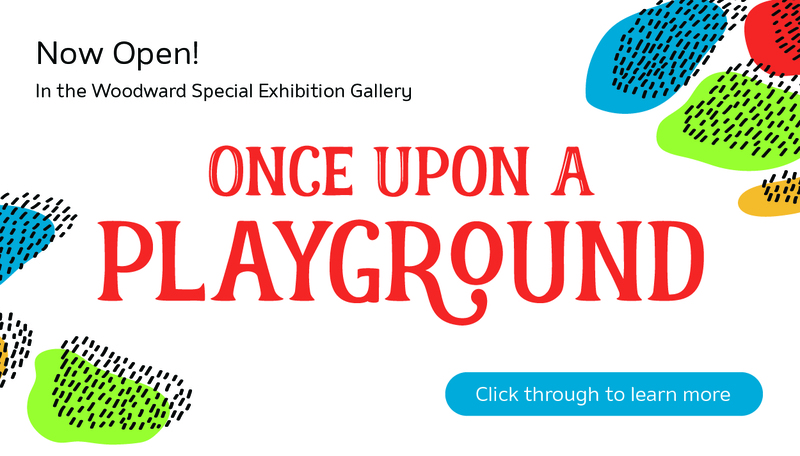 * At Once Upon a Playground, Fort Collins Museum of Discovery’s special traveling exhibition, take an interactive journey from the past to the present… and beyond. Featuring dozens of historic playground images, a climbable sugar beet playground structure, build-your-own play structures, and more – this birthday party add-on will put the Play in #LetsPlay. Have questions or need immediate assistance please call FCMoD’s Event Coordinator, Brie Lipari, at 970-416-2727.